I'm an independent graphic designer and illustrator based in Northern California. 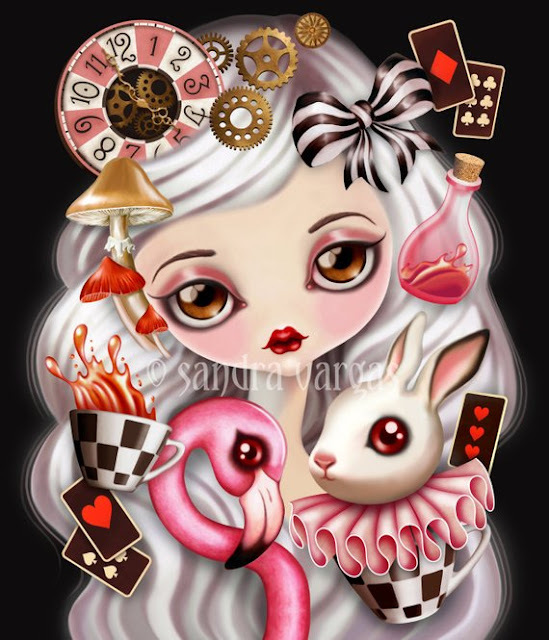 I love playing with duality creating sweet yet eerie characters and animals inspired by my love for story books from my childhood, Victorian-Gothic literature and my curiosity to peculiar and macabre imagery. I've developed my own personal technique and style using a combination of both traditional and digital media, which give my creations a touch of uniqueness and singularity. 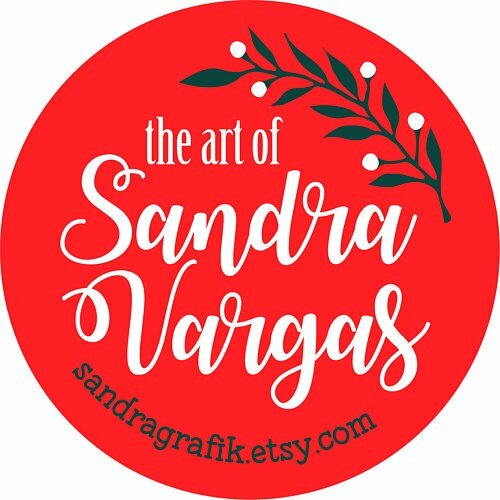 I accept commissions, custom orders and wholesale orders. Hi there! 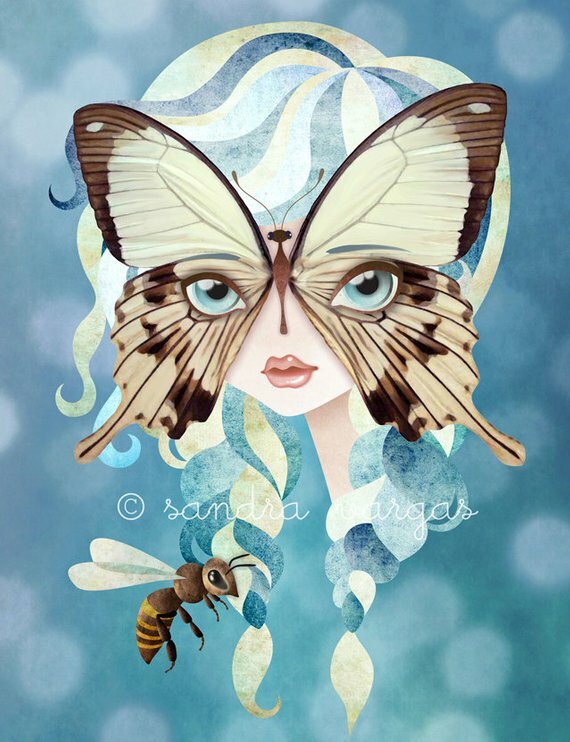 I'm so happy to share with you a little bit about me and my art through this amazing blog! I'm a Peruvian born graphic designer, self taught illustrator, and proud mom of two wonderful kids (of 17 and 11) based in Northern California. My imaginary world is filled with sweet and spooky big eyed girls and colorful animals inspired by classic childrens books, Victorian-Gothic literature and my love for sweet and dark imagery. 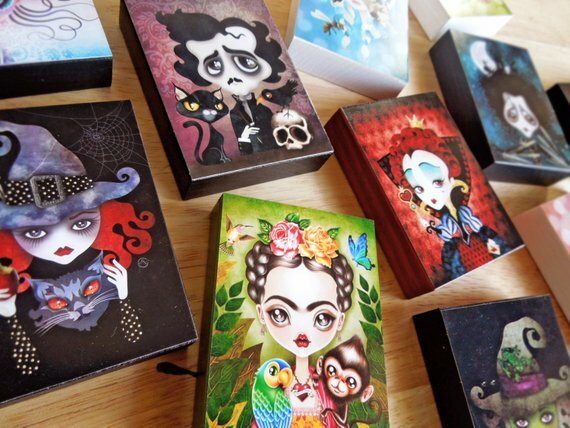 Tim Burton and pop culture characters are also a source of inspiration. I have a very eclectic taste! Since an early age I've always manifested a special curiosity in colors, forms and art in general. 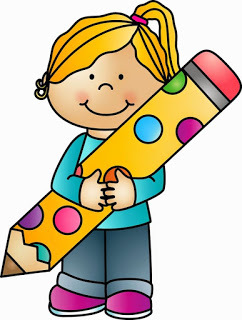 I obtained a degree in Graphic Design in my home country, working in the art department of several advertising agencies. However, my creative juices always pushed me to develop myself in a more artistic way so I transformed my graphic design skills into something new and different. I was trained in illustration with traditional mediums as a student, but it wasn't until 2009 that I retake my love for illustration merging my graphic basics with character design and digital painting. My work place is pretty simple! My family and I just moved recently so at the moment I've squished in my dining room corner, using a rolling cart to organize my stuff and the dining table for my laptop. A narrow closet with interior shelving in my hall-way is perfect to storage my art supplies and shop items. There's no small space when you need to create art! 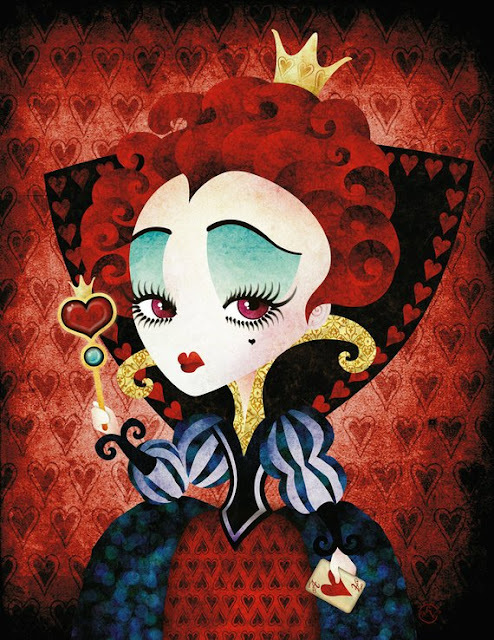 5) Where does your love for fairytales come from and what’s your favorite story? 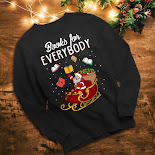 a simple and adorable book which I fell in love with! 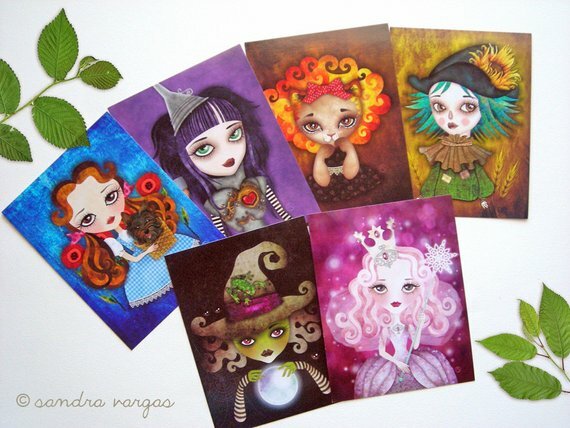 I opened my Etsy shop in 2008 selling custom invitations and digital cards until 2009 when I filled my shop with my own original illustrations. 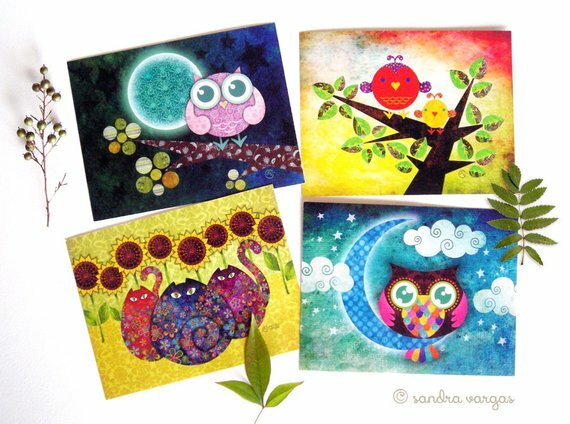 Now I sell not only illustrations but postcards, pocket mirrors, jewelry and a variety of accessories featuring my art. My work is also available on Redbubble, Society6 and TeePublic. 7) You make beautiful bookish art designs, where does your love for books come from? My grandfather treasured a big collection of classic literature including a variety of genres and authors, storaged in his bedroom, where I used to snoop and rummage around pretty often as a teenager. Thanks to my curiosity, I discovered the works of Edgar Allan Poe, Gaston Leroux, Oscar Wilde and Bram Stocker, some of my favorite authors. Without knowing it, my grandfather fed my love for horror and mystery books. 8) How do you capture the atmosphere of a story and turn it into a matching design? Transforming ideas and inspiration into art and then turning them into real life creations that you can use and wear is a fascinating and magical experience. My initial ideas and quick sketches are always written and drawn on small pieces of paper, old notebooks or post-it notes, and then everything is translated to my computer using a combination of both traditional drawing and digital painting. The best thing is working from home and the feeling of freedom! Besides, I really enjoy the whole experience from inspiration, creation, production, photo shooting, to packaging and shipment, and it's absolutely rewarding when you get the positive feedback from your customers. 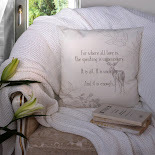 I'm always looking to create new stuff and integrate them into my shop. Currently I’m specially excited about a couple of small personal art projects which are totally different from my current work in terms of materials, so I still have a lot to learn. I consider my creative work as an everyday adventure. I like to see what the day-to-day has to offer me and I enjoy it! 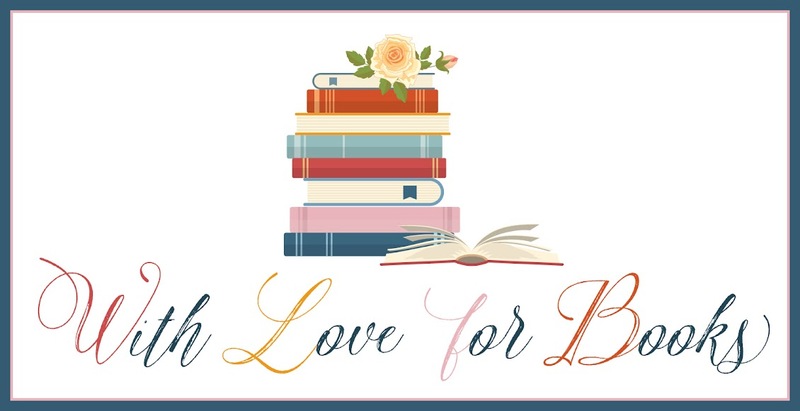 One very lucky reader of With Love for Books will receive a Cosmetic squirrel pouch (9.5“ x 6”) and a Mystery Pack containing assorted postcards, bookmarks, stickers and magnets from Sandra Vargas. Two runner ups will receive a Mystery Pack (each bag contains 8 pieces). I love this artwork. Right up my alley! Great artwork, beautifully executed too. I love your artwork! Everything is gorgeous! Your designs are so creative and unique, also I love how colorful they are! so imaginative and unique - love your shop!! 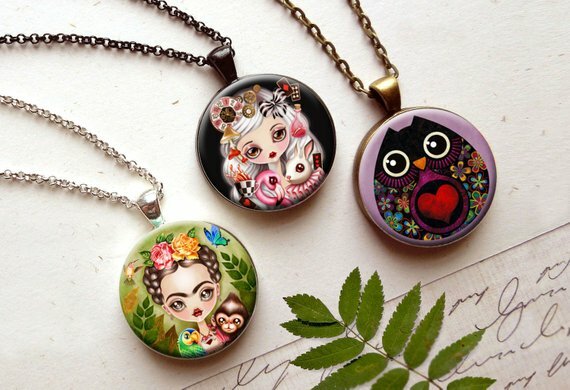 Gosh your designs are gorgeous - I have no idea which I would choose!!! 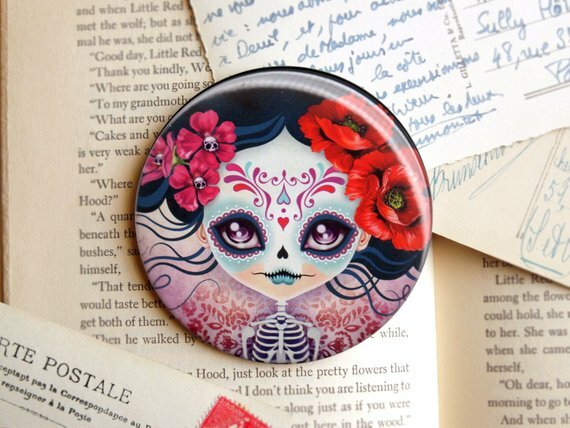 I particularly adore the sugar skull and the Alice ones! The caterpillar is so cute, love his different shoes! Great stuff. May all your wishes come true. Very talented. I am impressed. 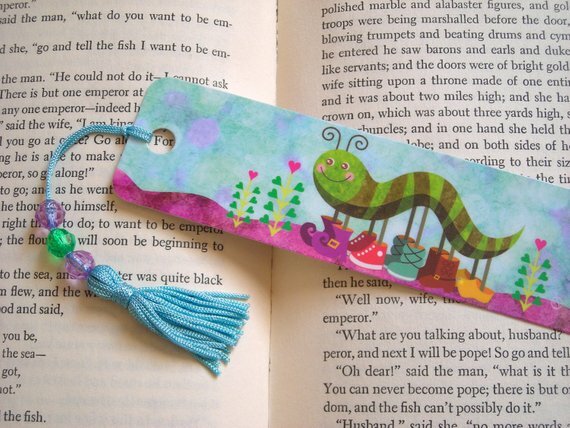 Love the bookish art design. 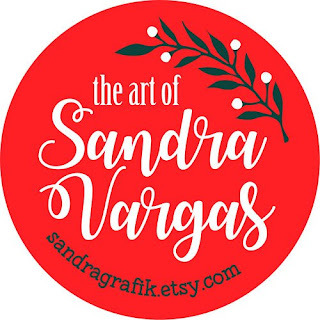 Sandra Vargas has adorable, colorful and wonderful items with her art! Beautiful creation and look magical. Thank you for the giveaway. 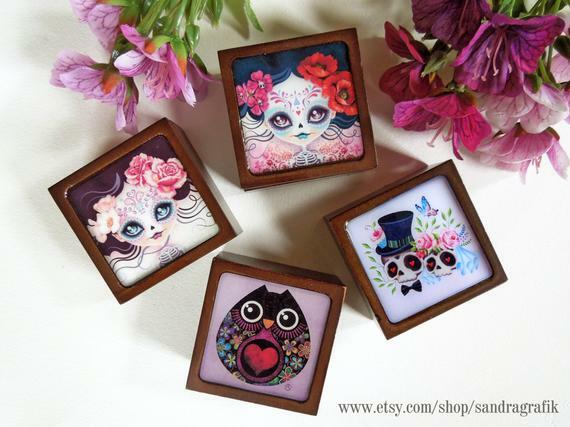 Oh my goodness, I am SOOOO in love with this shop and artwork!! you make some really cool stuff! I adore your work, very original and fun. You are such an awesome creator. Thank you for the chance. Wow, the items in the shop are gorgeous. I took about 15 minutes to choose one for the requirement as I kept changing my mind. Such a wonderful talent. 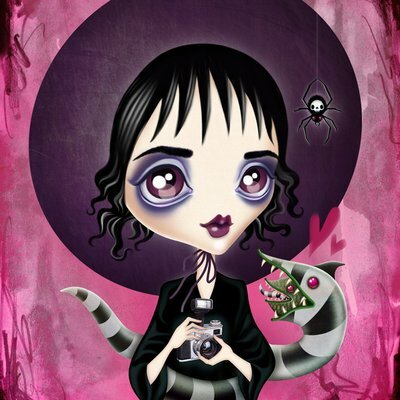 I like the Wednesday Addams and Lydia Deetz the best.